The “trail” template for public art has not just been massively popular in pretty much every major UK city in recent years, not least Liverpool. And why not? It’s a model that’s good for everyone. It’s good for the artists to get their designs in the public view, good for parents wanting to entertain their children for a day, good for the businesses on the route – who knows how many people might think to pop in when passing – and good for the council, who can point to these trails as cultural money spent on a highly accessible form of art. 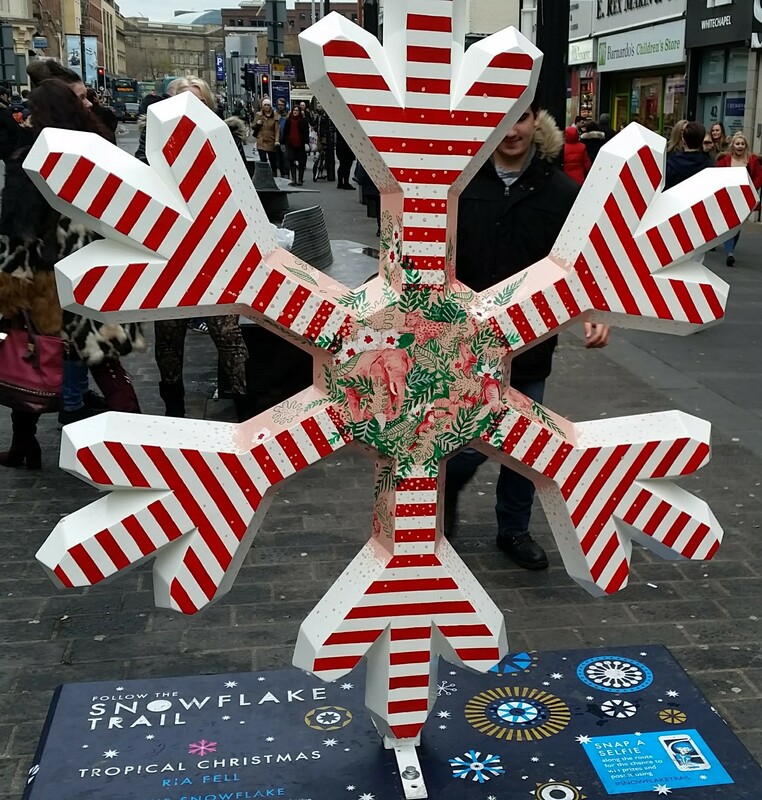 Liverpool’s latest is the Snowflake Trail, with around 20 stops located around an easily walkable area of the city centre. Pick up a free guide from various places around the city centre to get the map where you can tick off the ones you’ve visited, and a nice little story saying what the trail is about. 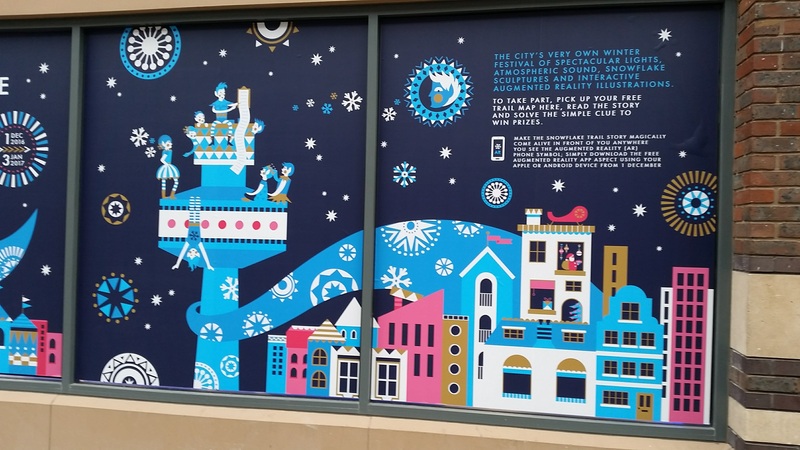 Organisers Open Culture have decided to be quite ambitious about what the trail includes so that beside the sculptures, there’s other twists on the Christmassy/ snowflake theme. The majority of the stops, and the most obvious talking points, are the sculptures. Each one has been designed by a different artist, and the selection of chosen designs is pleasingly diverse. This is the key to the success of a project like this – whether the artist has worked mostly with the form, theme or fun, the next one you see won’t be anything like the last. As usual I’m not telling you my favourite – go and see them for yourself. Also don’t forget to follow the instructions for tweeting a snowflake at FACT – it’s rather fun. There are some stops on the Snowflake Trail which, unless you were specifically looking out for them, you’d be likely to walk past, but these are actually the most ambitious parts of the route. 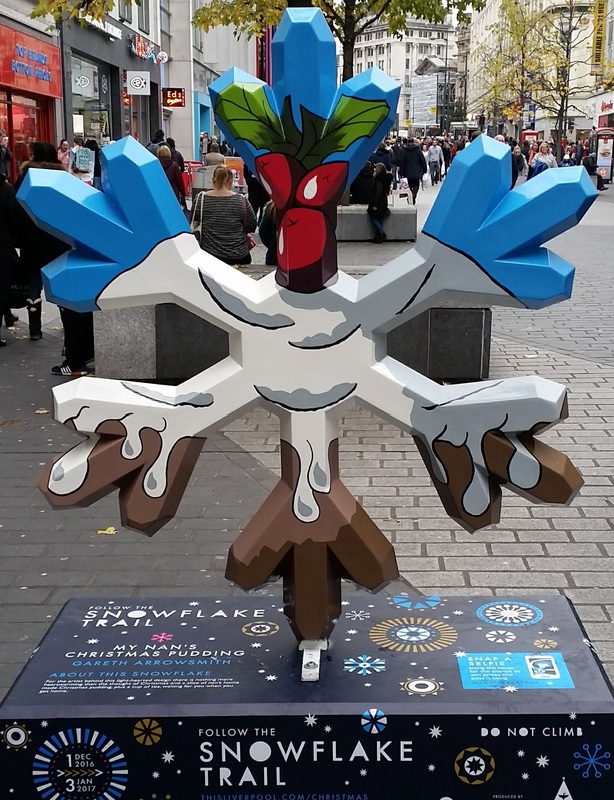 The success of Pokemon Go is proof that augmented reality is a great way of getting people engaged and talking, and the plain-looking posters on shop fronts are meant to be settings for virtual wonderlands. Which I’m sure they would be – if it worked. Unfortunately, I had a few problems. I eventually found the name of the app I needed – then found it low down the list in the Google Play store – but when installed and started up, all it actually did was crash my phone. I never got to view these enchanting scenes, and neither did anyone else I saw. I can imagine that it would only take a few people enjoying these scenes to cause quite a fuss and get more people to engage, but the technology has to work first. Maybe next year? Then there’s the Candy Cane Kitchen on Lord Street, or apparently on Lord Street, because I couldn’t find it. Neither could a friend and her daughter who were exploring the trail on the same day. It doesn’t sound like the sort of thing you could easily miss – maybe let me know if you find it? Nothing much to see here until technology catches up to the ambition. Despite these issues, it’s still a lovely thing to have occupying the city centre. On this busy Saturday when people were out to do Serious Shopping, they were providing a talking point for many members of the public. Some people may see the “Snap a Selfie” competition as somehow sad, but from what I saw it was getting people to take a short break from the hustle-bustle and actually stop, look at and talk about something artistic. Mission accomplished, if you ask me. I can see it becoming an annual project, and if they got the AR right for next year it would be even better. This entry was posted in Exhibitions, Home, Past exhibitions and tagged art, artist, Christmas, culture, Liverpool, public art, sculpture, shopping, snowflakes, trail. Bookmark the permalink.